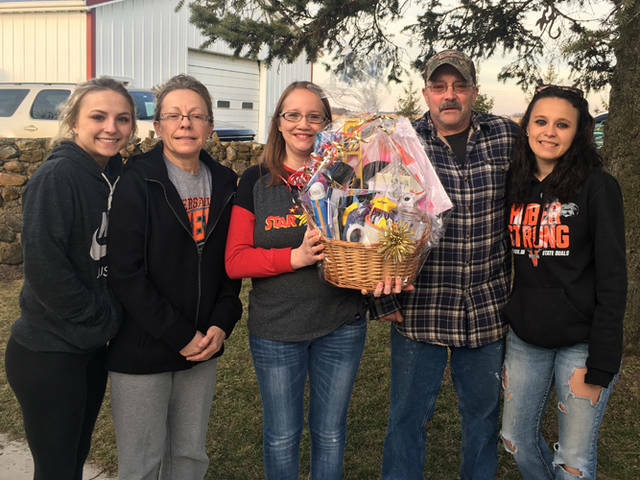 STAR 88.3 surprised the Huber family with a basket of love and encouragement, including a $50 gift card from The Inn at Versailles, along with $1,000 in community donations. VERSAILLES – After the death of Versailles High School student Trevor Huber in an all-terrain vehicle accident in January, STAR 88.3 and the local community came together to support his family. Christian radio station STAR 88.3, heard locally on 88.9 FM in Union City, accepts nominations several times a year for someone to surprise and then picks a few recipients and surprises them with a gift basket. For Valentine’s Day, STAR 88.3 accepted nominations from the community for someone who is going through a hard time or is an inspiration in some way. Amy Hoying, a teacher in Versailles, nominated Huber’s family. STAR 88.3 community representative Naomi Cantrell reached out to Hoying and other friends of the Huber family for more information about the family. But surprising the Huber family turned into far more than a gift basket. As Cantrell began to talk to friends and family, so many began to ask how they could help. Because STAR 88.3 is a non-profit ministry, it’s not legally allowed to raise funds for individuals, but the community wanted to help. An idea began to take shape, and the goal was to raise $1,000 to give to the Huber family so they could take their family on a summer getaway. It would be something they could look forward to and a way to remind them a few months down the road that their community loves them. So, Cantrell began a GoFundMe page to give the community a place to give love to the Huber family. Donations came pouring in, and it was not long before $1,000 was raised. On March 27, Cantrell and some friends of the Hubers surprised them at their home. STAR 88.3 provided a basket of love and encouragement, including a $50 gift card from The Inn at Versailles so the family could go out for a meal. In addition to the basket, Cantrell told the family what their community had done for them. STAR 88.3 is accepting nominations again; this time it’s give love for Mother’s Day. Individuals can nominate their moms or a special mom in their lives for a special surprise from STAR 88.3. Individuals can fill out a nomination form at www.star883.com.